Electrocution remains the leading cause of crane-related deaths throughout the world, representing approximately 25% of all crane accidents. More than half of all electrocutions are associated with the crane boom, cable or load/load line contacting an overhead power line. The remainder involve contact between power lines and other unspecified parts of the crane. Data from the National Coroners’ Information System from 2000 to 2008 revealed 22% of fatal accidents involving cranes were due to electrocution. These statistics are staggering – as an industry, we have failed to improve safety outcomes when it comes to overhead power lines. In fact, the data suggests that accidents of this nature are occurring more often. In this issue of Lifting Matters, you will read about several electrocution incidents involving cranes coming in contact with power lines which have occurred over a 25-year period. Together with the data, they sadly show a trend in the wrong direction when it comes to working with cranes around overhead power lines. 1. Are we providing sufficient education to our people, so they truly understand the risk posed by overhead power lines, including the potential ramifications of both contact, and closeness, and what to do when this does occur? 2. Are we using all available resources to mitigate the risk posed by overhead power lines, and if not, what else should we explore? 3. Where are we falling short in the process of implementing lessons learned from past incidents? I have been stunned to hear some of the misconceptions and the lack of understanding around how power conducts, the attributes of overhead power lines, and what to do when you come into contact with live power lines. We take it for granted that junior members of the industry understand the basic principles of electricity and how they affect us in the crane industry. I won’t go into detail here about this as another author has provided a great ‘basics of electricity’ in this issue, but I will touch on some common myths I have heard. The electrical current moves in a ripple effect outward from the energised machine. It is not just the crane operator or those directly under the line who are at risk. FALSE. Overhead power lines carry a variety of voltages from around 120 volts to upwards of 700,000 volts. Even the lowest level of voltage is fatal. The severity of the shock will depend on the voltage, but almost always that voltage is enough to seriously injure a human being if not result in death. FALSE. If you are involved in an incident where a crane boom strikes an overhead power line, there are several ways you can be injured, including as the rigger/dogman, the operator, a bystander or a Good Samaritan. Rigger/Dogmen - In 90% of overhead power line incidents, it is the rigger/dogman who is most severely injured or killed. This is because the rigger acts as a conductor of the electricity to the ground through their contact with the load, taglines or ropes resulting in electrocution. Operator - The operator of the crane is usually separated from the ground by the crane itself, but there have been instances where the operator has attempted to leave the cabin and made contact with the ground and the crane simultaneously resulting in electrocution. If possible, remain in the crane until you have received clear confirmation that the power has been switched off. If you do need to evacuate the crane, you must jump completely clear of the crane and be sure not to make contact with any part of the crane and the ground at the same time. Then you must shuffle in very small steps away from the energised equipment. Bystander – For the same reason an operator must shuffle away from the energised equipment, bystanders are also at risk because the electrical current moves in a ripple effect outward from the energised machine. Picture a pond after you’ve thrown a stone into the middle of it. This is how the electricity moves through the ground, with areas of high and low potential. If you touch an area of high and low potential at the same time the current can flow through your body resulting in electrocution. A Good Samaritan – Devastatingly, there have been accidents where a shaken and concerned worker has rushed to the aid of a colleague who has been electrocuted and suffered significant injuries or fatality in doing so. You cannot go near your injured colleague because the electricity flowing through them can also injure or kill you. The victim cannot be approached until confirmation has been received that the vicinity has been de-energised. Marking exclusion zones at ground level with cones, barriers and tape or flags is the most basic precaution. "Overhead power lines are insulated and therefore do not present a risk of electrocution." FALSE. Overhead power lines are not insulated. Sometimes they have the appearance of being insulated, but this is just weatherproofing. Whether the line is weatherproofed or not, if you touch it you will be electrocuted. I think we can do more to mitigate the risks associated with overhead power lines, especially with many of the new technologies available to us. 1. Proximity warning devices: there are devices available that emit an alarm when a crane boom becomes too close to a power line. Even with the use of such devices, an exclusion zone and clearance distances must be maintained, but should the operator have a lapse of concentration these devices provide a backup warning. 2. Electronic boom height restrictions: like the E-Fence Technology being used by CAT which we discussed in the September 2018 issue, the crane industry can use this technology to enable the crane boom to freeze automatically before striking an overhead power line. By programming height restrictions into the machine based on the site conditions, in the event of an operator’s lapse of concentration the crane would stop operating completely outside of the defined boundaries. 3. Boom cage guard: a boom cage guard protects the boom, preventing it from becoming energised in the event of striking overhead lines. 4. Insulated links: insulated links between the hook and the load provide an extra layer of protection for the rigger/dogmen. They do not prevent the rest of the crane from becoming energised, but they do stop the current from flowing through to the load thus injuring the rigger/dogman. 5. 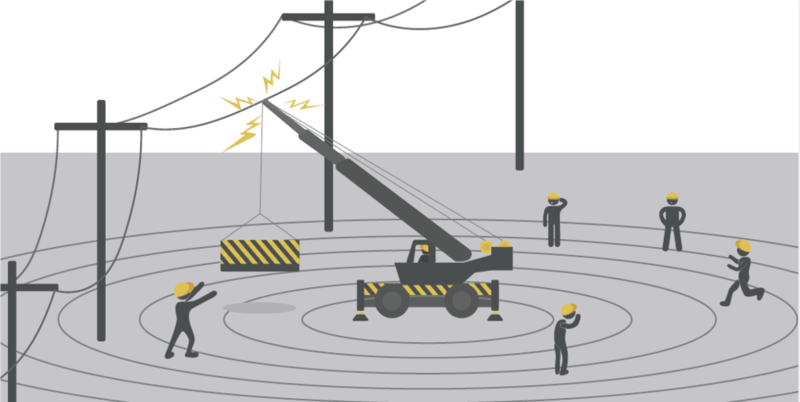 Augmented reality warnings: this technology is still in its early phases of development, but wearables such as interactive safety glasses can also assist both operators and riggers with obvious visual warnings about the presence of the overhead power lines. With site information loaded into the application, such as the geolocation and height of any power lines in the vicinity of a work site, smart glasses can illuminate this hazard to all workers thus preventing a lapse of concentration or unawareness of the presence of overhead lines. We can talk about the practicalities of overhead power line incidents, but the reality is there is a wealth of information out there about these incidents, the hazards of overhead power lines and countless ‘look up and live’ style campaigns. Instead, we need to step back and critically evaluate our failure to learn in this area. It takes a mature organisation with a mature safety culture to focus on identifying and implementing learnings from an incident and work on improving prevention. Sadly in our industry, many of us still default to becoming highly defensive when an incident occurs, instead focusing on attributing blame. Yes, we all have safety responsibilities we need to be held accountable for, but we must also learn to be open to constructively investigating incidents. It’s far too easy to blame an operator for failing to look up, a lapse in concentration, or for a supervisor’s failure to ensure power lines were de-energised, but these conclusions result in quick fixes. This approach does not factor in the root cause – where did the safety management system fail? What other controls could we have had in place to prevent this accident? Dr Andrew Hopkins is the author of an award-winning thesis on the BP Texas City Refinery Disaster. His thesis, entitled ‘Failure to Learn’, provides a harrowing insight into the causes of a major explosion at the Texas City Oil Refinery in 2005 which killed 15 workers and left 170 others seriously injured. As indicated in the title, there were sadly many previous incidents from which the parties involved in this tragic accident could have learned, adapted and improved prevention. However, their safety culture meant they failed to do so, subsequently resulting in the needless death of 15 people. Let’s not make the same mistake. I urge you to actively investigate overhead power lines and how we can prevent incidents related to them. Educate your people and each other with vigour on this vital topic, which presents the greatest risk to our industry. Together we can learn how to reduce and eventually eliminate electrocution related injuries and fatalities in the crane industry.